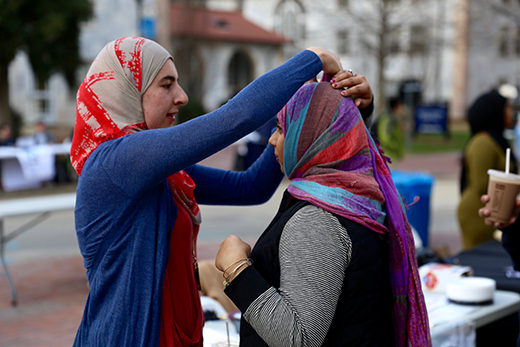 Emory's Muslim Student Association kicked off Islamic Awareness Month by hosting last week's Wonderful Wednesday. Since Feb. 1 is World Hijab Day, the MSA invited passersby to try on headscarves and ask questions about hijab and Islam. Here, MSA member Talah Bakdash (left) helps a student wrap her scarf. With smiles and curiosity, they approached the Emory Muslim Student Association (MSA) table, situated in the heart of Asbury Circle last week for Wonderful Wednesday. On the table, a tumble of literature, from pamphlets listing events planned on campus for Islamic Awareness Month to notecards for passersby to anonymously submit “Ask a Muslim” questions that would later be answered on the MSA Facebook page. But it was the scarves that drew most of the attention — a generous pile of big, colorful headscarves presented in association with World Hijab Day that carried an invitation to press beyond cultural assumptions. “Do you have any questions?” asked Talah Bakdash, an Emory sophomore majoring in creative writing and psychology, who has chosen to wear the hijab since she was in the sixth grade. It was the ultimate icebreaker. Soon, a small crowd of men and women were gathering to ask questions — “Is it hot? What does it mean to you? Why do you choose to wear it?” — and allow Bakdash to deftly fold and wind the scarf around their own heads. As a sophomore majoring in anthropology, Esther Garcia found herself drawn to the MSA table on Wednesday to talk about the faith and experience what it felt like to briefly slip a hijab over her own delicate braids. For MSA President Sundus Tameez, the Wonderful Wednesday gathering was not only the kick-off for events scheduled on campus for Islamic Awareness Month, but a forum to help demystify the religion. Tameez says she’s grateful for the opportunity to create dialogue at Emory, where about 325 undergraduate students in Emory College self-identify as Muslim and the MSA has maintained a campus chapter for nearly 25 years. Tameez grew up in Memphis, Tennessee, the first student at her private, all-girls school to wear a hijab, which she emphasizes is a personal choice, to be decided by each Muslim woman. For her, the scarf serves as a physical reminder of her spiritual beliefs, her devotion to God, and a reminder to live her life with integrity and accountability. Part of the role of Emory’s MSA is to help others better understand aspects of the faith, Tameez says. To help facilitate that, the campus community is invited to attend a series of free public events scheduled this month. Events for Islamic Awareness Month range from a public program held last week on being black and Muslim to a Feb. 11 health and fitness promotion event that will bring over 60 Muslim schoolchildren from around Atlanta to campus to meet with former NBA star Mahmoud Abdul-Rauf and former NCAA women’s basketball player Bilqis Abdul-Qaadir. Celebrate Islam — Friday, Feb. 24, time and location to be announced. To learn more about Islamic Awareness Month at Emory, visit here or write emory.u.msa@gmail.com.